President Buhari has submitted his presidential nomination form to the leadership of his party, APC. 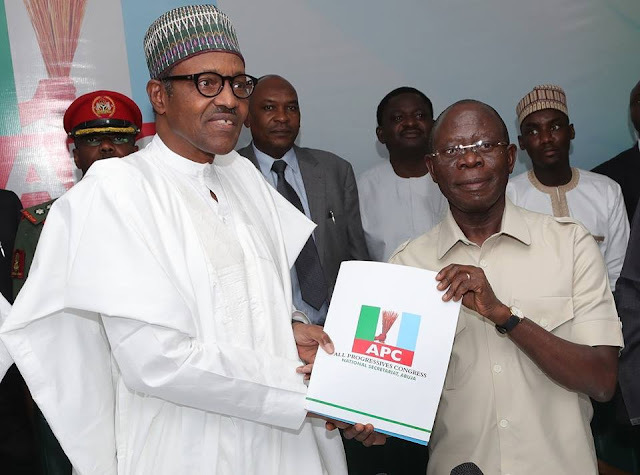 At a brief ceremony which held at the party headquarters in Abuja yesterday Wednesday, September 12th, President Buhari presented the form to the National Chairman of the party, Adams Oshiomole. Recall that last week, a group of Nigerians doled out N45 million to purchase the form for him and then presented the form to him at the presidential villa on Tuesday, September 11th.